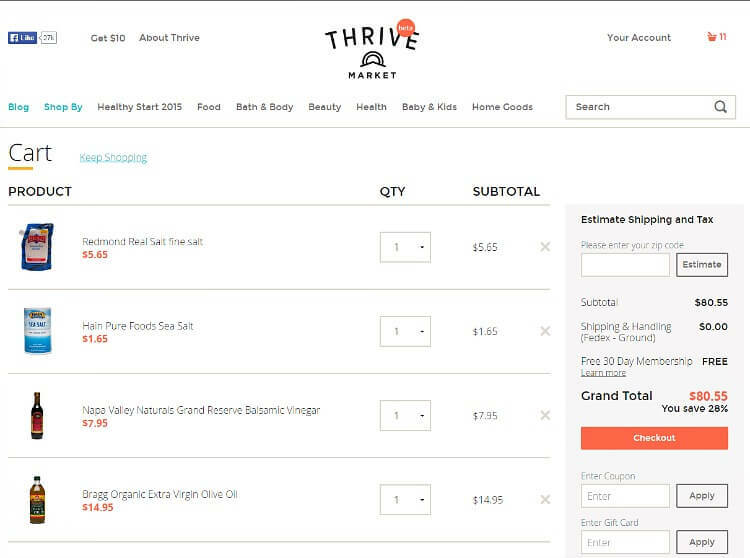 Thrive Market- Is it Possible to Eat Healthier and Spend Less? When I was in University, I relied on instant noodles and cheap bento boxes from the local convenience store. Living in Japan has its perks, but even the Japanese have foods that are anything but healthy. When I moved back to the States, my degree didn’t really line my pockets and I ended up relying once again on cheap food sources. Mac & Cheese in a box, instant rice, cup of noodles….anything cheap I could get my hands on that didn’t break the bank! A lot of my clothes and living essential were yard sale and thrift store finds. Dates were reliant on big get-togethers with friends and we would all chip in for pizza and borrow a movie that someone else owned. You know you’re low on cash when you can’t even afford Netflix. My first apartment with my fiancé literally only had a huge bean bag chair and a mattress on the floor for furniture. We ate processed food most of the time and neither of us felt great. So yeah, living cheaply. Not very glamorous. At the time, I thought I was being frugal, but what happened was a discovery that had me rethinking my cheap food choices. I soon realized the true cost of eating cheaply and guess what? It had nothing to do with money. Soon after ending a struggling and health sucking relationship, I found myself in pretty bad shape. My adrenals were burnt out, my sleep wasn’t restful, and my overall health was seriously lacking. I had the worst bronchitis of my life and couldn’t get rid of it for months. My monthly cycle became erratic and then non-existent. I had really bad acne too. The cheap food I was buying wasn’t doing me any favors and it certainly wasn’t supporting my health. Not when my body needed it most. I began learning about real food and natural skin care to help repair myself inside and out. With every mouthful of nutrient dense food, I began to regain and re-invent my health. My hormones balanced out again and my skin became clear again. I stopped getting sick. Getting so ill was the worst yet best thing that happened to me in retrospect. It forced me to prioritize my health. If you have ever been chronically ill, you know how this feels. Humbling and liberating at the same time! With each addition of nutrient dense staples, my grocery bill steadily and sometimes dramatically began to climb. It was worth it (I was worth it), but I found myself wishing for my fairy godmother to come and change all those steep prices to more affordable ones that didn’t leave moths in my wallet. OMGosh you guys! This is Costco meets Whole Foods meets Amazon! You literally don’t even need to leave your house (heck, I’m in my pajamas right now shopping on Thrive), and for less than $5 a month ($59.95 annually) you can shop over 3,500 of the highest quality natural and organic products available for 25-50% BELOW retail prices. Thrive Market offers nutrient dense food, high quality supplements (like Garden of Life, Host Defense, and Alive! ), natural personal care and beauty products, and home essentials like Bob’s Red Mill, Dr. Bronner’s Castile Soap, Nativas Naturals, Real Salt, Spectrum Naturals, and many more straight to your doorstep at wholesale prices. Plus, you get FREE shipping on orders over $49. Is this for real? Yes, yes it is! At first I was a bit skeptical about Thrive, but once I logged in and began to explore the site, I immediately saw the immense value in it. I saw all of my pantry staples for sale (the wholesale prices were BELOW my employee discount at work AND Amazon!). 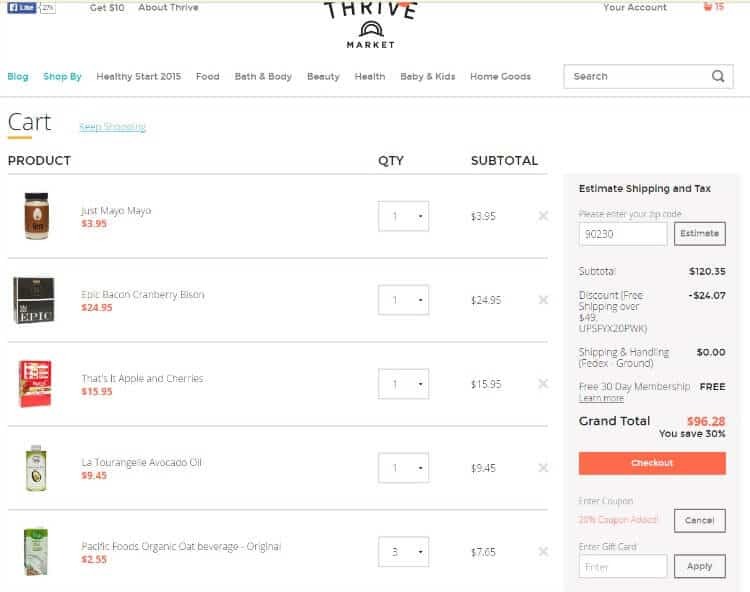 The First photo is my opening order on Thrive Market. I was able to get 15 items for less then $100. Plus a few other things that are convenient to have for take to work lunches. I tried to get the same items on Amazon but 5 items in I was already OVER $100…holy cow! This doesn’t include any additional shipping costs. This is just an example of the huge savings you can get on snacks shopping through Thrive Market. Of course I typically make a lot of my own versions of these, so I wanted to compare a few REAL staples that most people can’t make themselves. The first photo is my screen shot for Thrive Market. I was able to get 11 pantry staples like salt, coconut oil, organic sugar, and olive oil for just over $80. 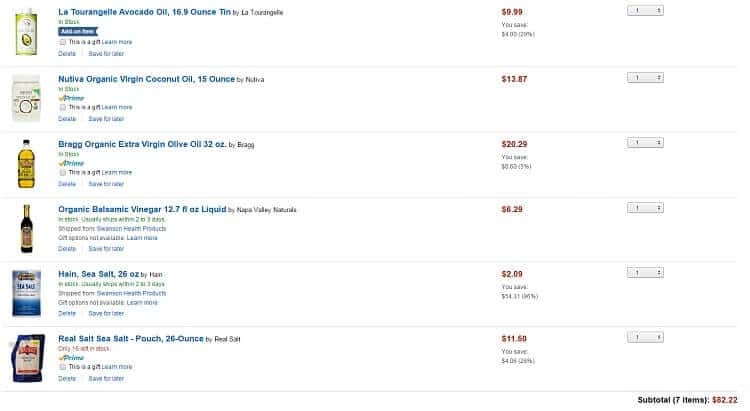 The second screen shot is my attempt at placing the same order on Amazon. Some items included shipping costs (not included in the total) and I was only able to get 7 items for about $82. If the items you’re looking for are non-perishable and fall under the whole foods category, chances are it will be available at Thrive Market. *Make sure to check back if your favorite items are out of stock. Thrive is really good about getting things in quickly! In fact, they had to move to a larger warehouse in order to fulfill the amount of orders coming in! 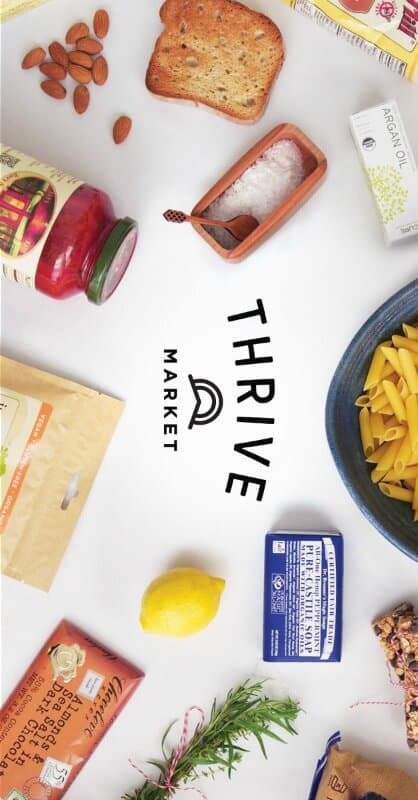 Thrive Market Makes it Possible for Everyone to get Real Food! Not only does Thrive want to make eating healthy affordable, they also want to make it affordable for EVERYONE, especially low-income families. When you purchase a Thrive Market membership, Thrive donates a free membership to a low-income family right here in America. Foods that these families couldn’t dream of affording are now available to them at a huge discount. See how much you can save with Thrive and Click Here for a special FREE 2 Month membership with an additional 20% or first order! Yep, that’s an additional 20% off on items that are already 25-50% below retail! Click Here For Your Free 2 Month Membership + 20% Coupon!